On Boxing day the afternoon gave way to evening in a rush of color that pulled me outside, running down the path to the river. I had enough time to get the tripod set up and make a few photographs before the pastel hues evaporated, leaving the dark shades of blue to fight briefly against the night. 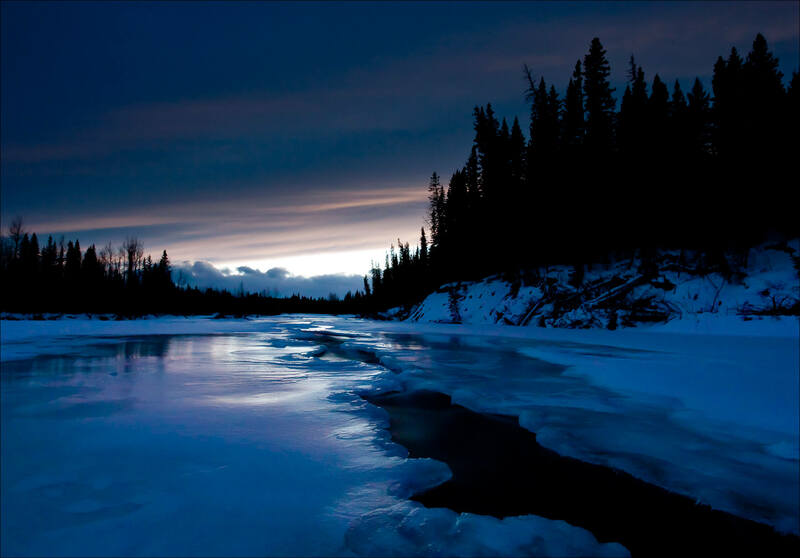 This river is the Elbow and it runs down from the Canadian Rocky Mountains, east through forests in Kananaskis and out onto the Albertan Prairie through Springbank. 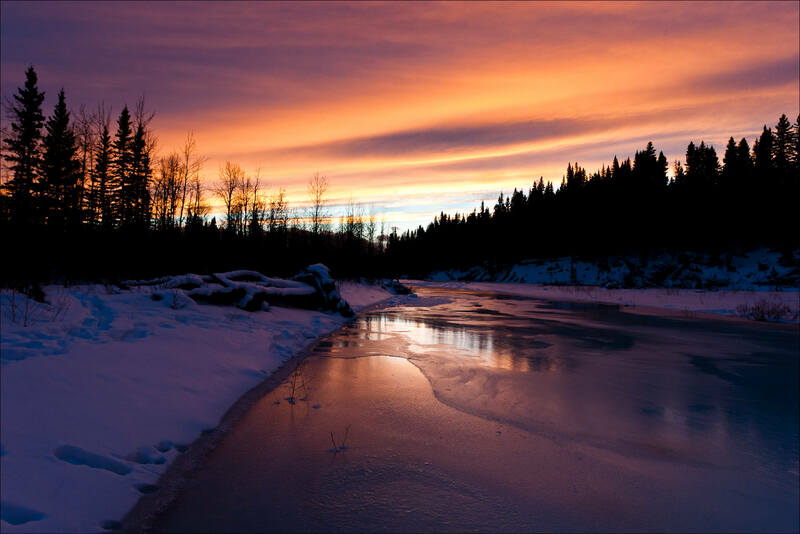 The Elbow River’s source is Elbow Lake, from there it runs through a large section of Kananaskis, past Bragg Creek and enters Calgary at Weaselhead Flats. West of the Calgary Zoo, the Elbow joins the Bow River and they continue eastward joining the South Saskatchewan River and finally entering Hudson Bay. It does not draw as much attention as the Bow River which runs through Banff, Canmore and Cochrane before reaching Calgary. However it hosts many beautiful locations and is where I spend much of my time photographing when I’m outdoors throughout the year. This entry was posted on December 29, 2010 by Christopher Martin. 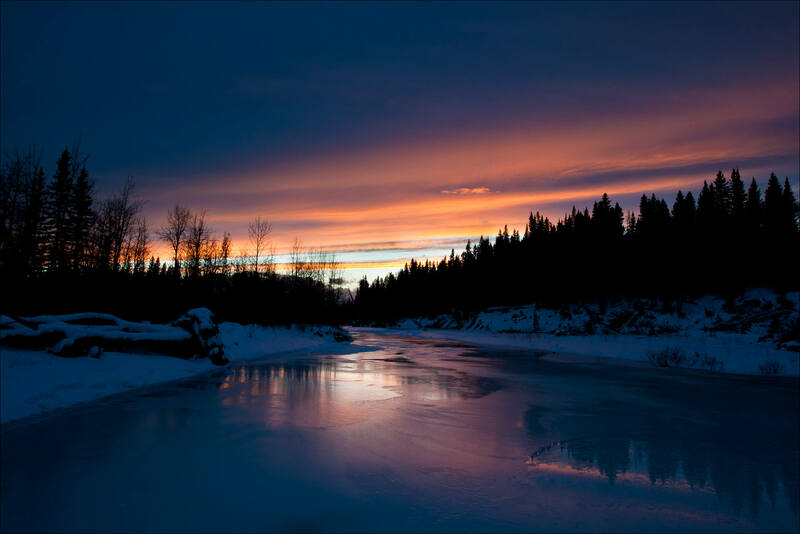 It was filed under Bragg Creek, Kananaskis, Landscapes, Outdoors, Sunset, Water, Winter and was tagged with alberta, bragg creek, Canada, clouds, Elbow River, evening, forest, ice, landscapes, photography, river, silhouettes, sky, snow, sunset, water, waterway, winter. These are f$%#ing amazing. Capturing the crazy colors of the world we fail to appreciate until someone points it out. Thanks for commenting. I’m happy that these are working for you. Happy New Year to you. Lovely, lovely colours and perfect compositon. Thanks for sharing them. They’ve warmed me up! Thank you Chris. All the best in the new year to you and yours.